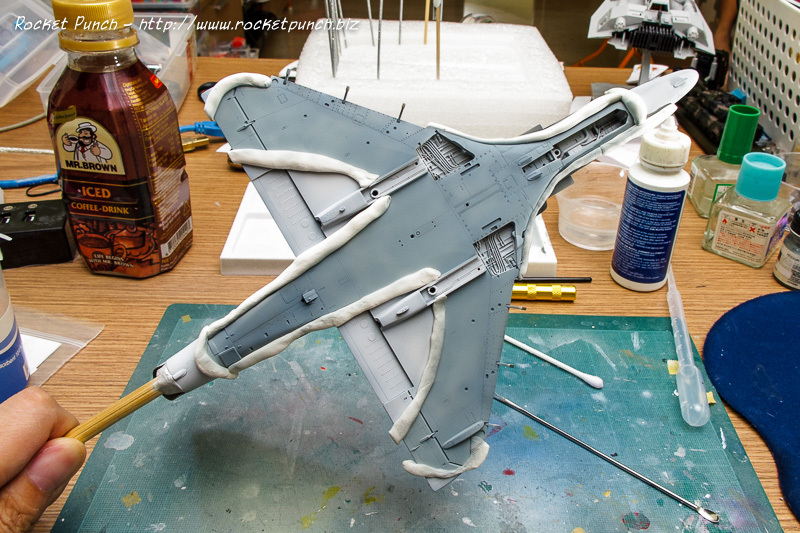 This is a Hasegawa 1/48 Skyhawk kit to be draped as TOPGUN 56, an A-4E flown by the US Navy as an Aggressor. The scheme is very unique with a desert camo MiG-17 silhouette superimposed on the aircraft. This build is heavily reliant on the excellent article by David Aungst at Hyperscale and the info found on the TwoBobs decal sheet. 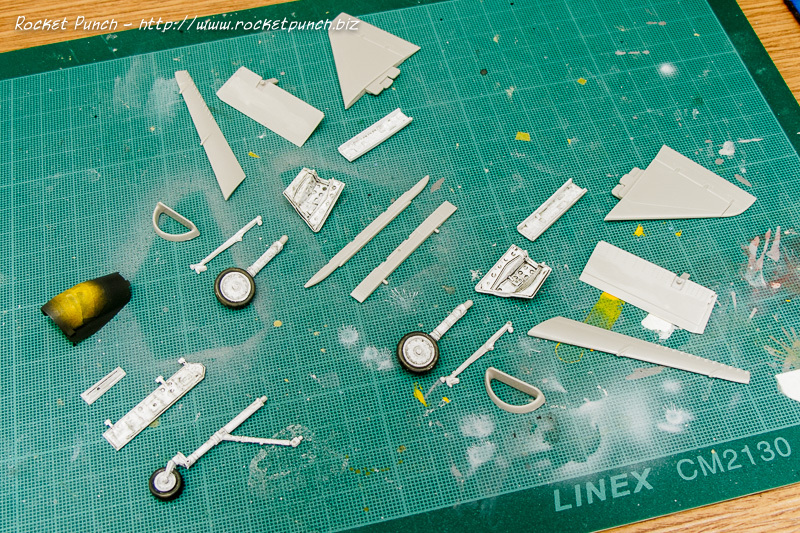 As I restart this build, the kit is already in a grey-primed state and the undercarriage parts were handpainted in white and given a wash of Black Grey a long while back. I didn’t do a very good job at them to be honest. I’ll see if I can live with it down the road. It’s more important to do the camouflage properly as that’s the highlight of this build. I decided to preshade with Black Grey instead of re-black basing the whole kit. As usual, I’m not that particular nor neat about the way I do it but I do make sure I didn’t paint the undercarriage bays. 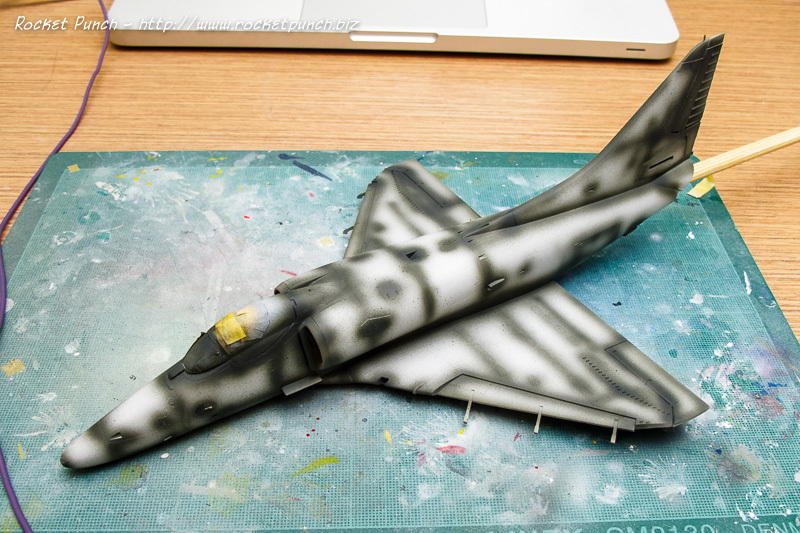 So first up I painted with Lifecolor UA023 Gray color on the parts of the aircraft that’s grey. The rest I left as is with the preshade on. Using blu-tack to mask, I then tackled the bottom with Model Master Acryl Medium Grey. I didn’t get the pattern right and there’s overspray but I’ll fix those in the fine-tuning stage. I also then sprayed the undercarriage bays with Game Color Dead White. 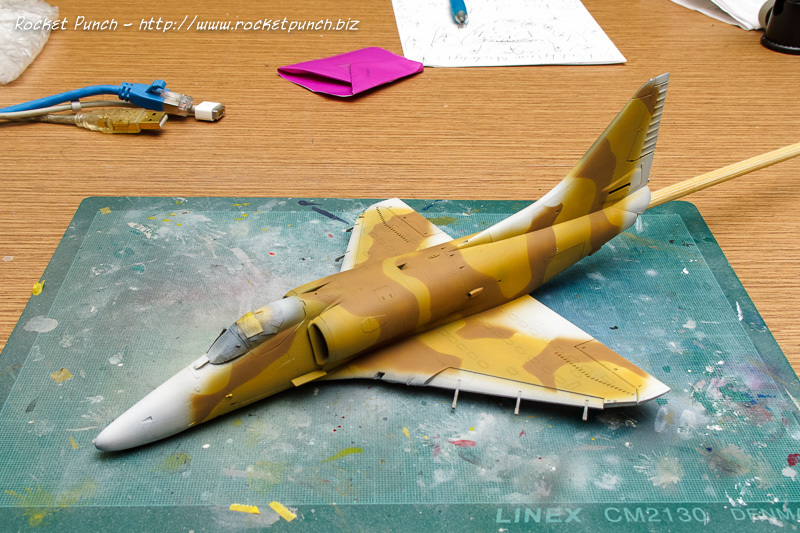 For the top-side camouflage pattern, I first painted Model Color Desert Yellow. Then it was Model Color US Tan Earth for the darker brown color. Both of these were done with blu-tack masking. The colors I’ve used aren’t 100% correct but the photo references available are all scans of old 35mm photos which don’t have the correct color fidelity anyway. Close enough is good enough for me. Next up is corrections and fine-tuning of the camouflage. This one’s been in the backburner for awhile (what else is new?) so it’s time for it to see the light of day again. The plan is OOB with decals from TwoBobs Decals. Back when the US Navy ran the United States Navy Fighter Weapons School aka ‘TOPGUN’, it operated A-4 Skyhawks in the role of the adversarys, ie. the bad guys. 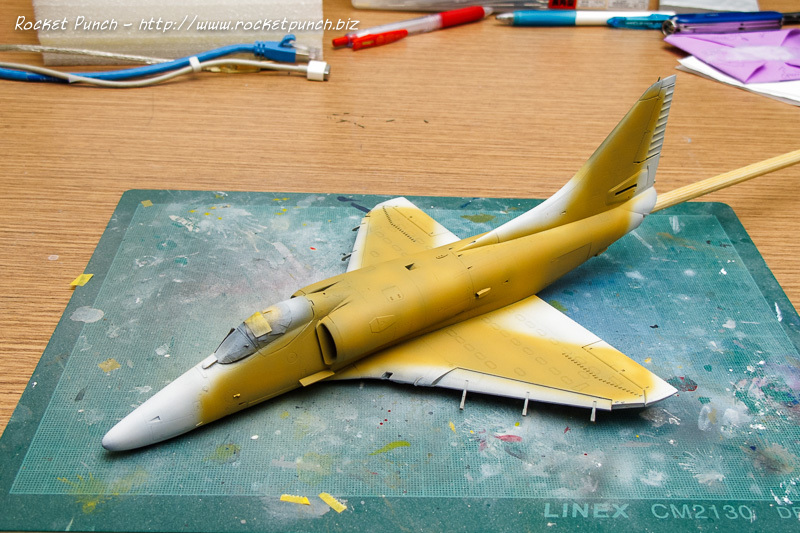 This particular Skyhawk took that role to the extreme by having an actual silhouette of a MiG-17 painted on it. 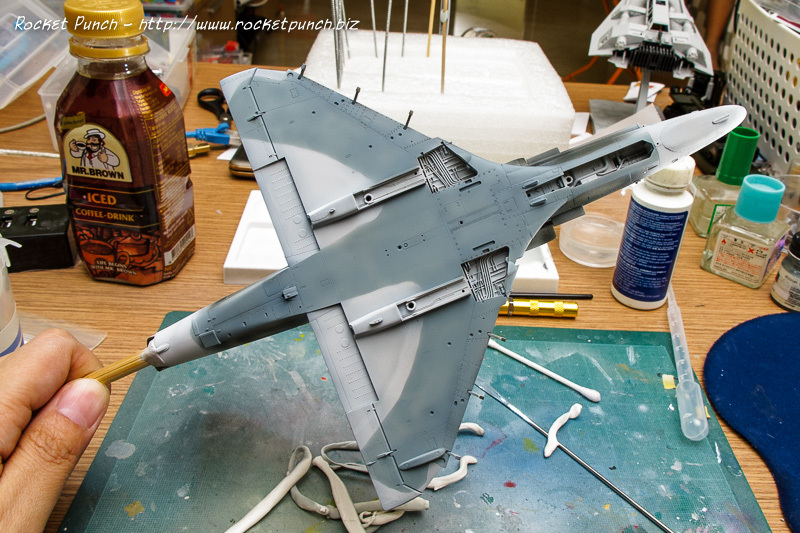 This project is heavily reliant on the excellent article by David Aungst at Hyperscale, who did all the research required to do up an accurate Top Gun #56. In fact, the TwoBobs decals are also based on this same research. 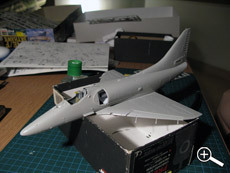 The kit itself is the excellent 1/48 Hasegawa A-4E/F kit. The cockpit is surprisingly detailed and with the canopy opening being so small, I think it looks more than adequate. Based on the article, I needed to modify the cone shaped fairings that’s attached all over the airframe. The cone tips need to be cut off first. Work is actually quite straightforward and I managed to get quite far in assembly. The kit also broke down into very easy subassemblies. The landing gear and landing gear doors were all handbrushed with white and given a wash of black gray.